Only a few days ago we reported that Ted Morgan, the founder and CEO of geolocation services Skyhook Wireless, let slip that rival Google won a deal to provide service for the Sony Ericsson Xperia X2. Well, loose lips sink ships the old saying goes, and in terms of information being revealed, this could be the Titanic. Mr. Morgan's comments not only confirmed the existence of the X2, but also was an indication that the new Xperia would be running Windows Mobile just like the original model. Alone, it is a good story, but now we have confirmation from another player. 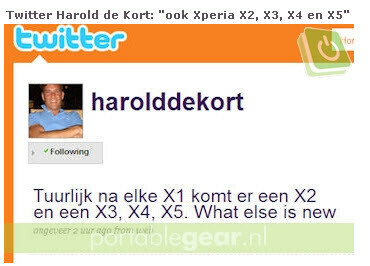 The Sony Ericsson Marketing Communications Manager for Benelux, Harold de Kort, said in a Twitter posting that there is a Xperia X2 in the works. UnwiredView translated the post to read, "Of course after each X1 comes X2, X3, X4 and X5. What else is new?" The web site also reports that the follow-up to the X2 will be the X5 with the X3 and X4 scrubbed, because the numbers 3 and 4 are considered bad luck in the region. Until we get some more loose lips soon, this should be enough info for now to get fans of the panel based handset excited about a sequel.